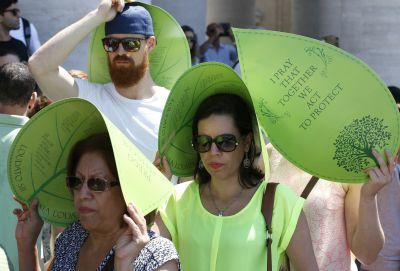 VATICAN CITY (CNS) — Environmentalists from around the world and from different faiths were among the tens of thousands of pilgrims gathered for the Angelus with Pope Francis June 28. 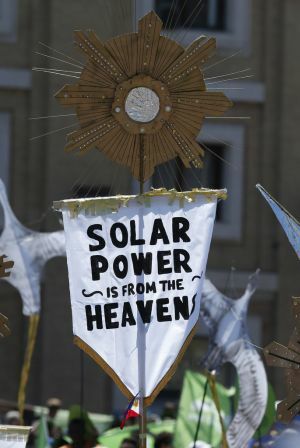 They marched a little more than a mile through Rome’s city center, ending in St. Peter’s Square, to demonstrate their support for the pope and his encyclical on the environment, “Laudato Si’, on Care for Our Common Home,” published just 10 days earlier. Once in the square, they gave other pilgrims there leaf-shaped posters with excerpts from Laudato Si’, as well as quotes on care for creation from other religious leaders. The march was endorsed by the United Nations and a number of Catholic organizations, including Catholic Action and the Global Catholic Climate Movement; the theme was “One Earth, One Human Family.” Marchers also urged the adoption of a new global climate change agreement at the U.N. conference in Paris in December. 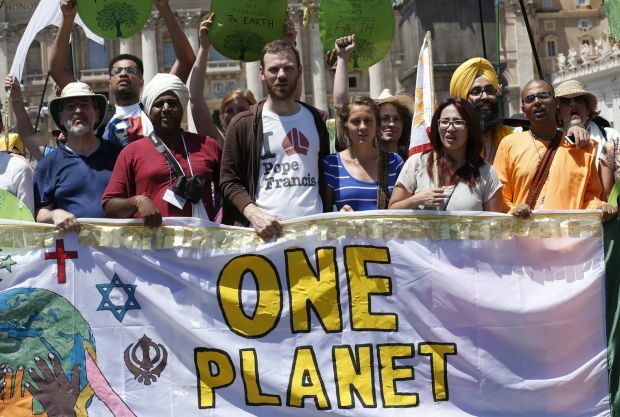 Among the marchers were participants at an international interfaith climate change conference held in Rome, which the pope noted. The June 29-July1 conference was organized by Our Voices, an international and interfaith climate change movement, which gathered about 100 “emerging leaders” in environmental matters under the age of 40. On the heels of this conference, the Pontifical Council for Justice and Peace and the Catholic International Cooperation for Development and Solidarity were also to hold a conference on the encyclical in Rome, July 2-3.